Want to quickly see how the open-source software Monkey CMS works? You'll find a free and updated demo installation of Monkey CMS here. We are currently updating the Monkey CMS demo. Please check back shortly. There will be a new version up soon. Monkey CMS is a free open source content management system that uses PHP as a programming language and a MySQL database to store information. It was first registered on SourceForge on September 7, 2006 and is the first Azerbaijan Open Source Project from HTP Security Team. 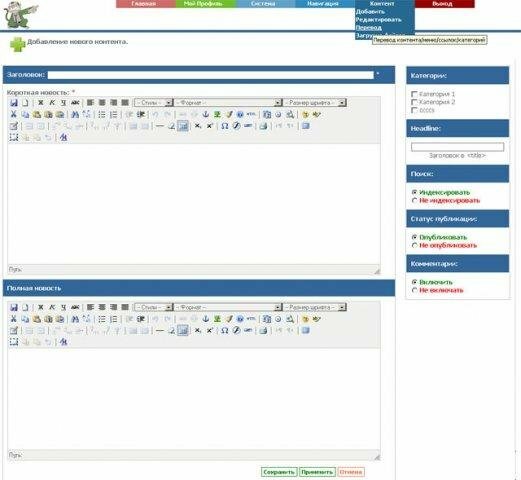 The admin interface was only available in Russian. Some examples of features include a multilingual system to display content in different languages in the front end, an easy template system that allowed you to change the appearance of your online demo using themes, RSS 2.0 and unlimited categories. If you want to get a complete review of this content management system you can download the software using the link below and create your own Monkey CMS demo. The last version available for download is 0.0.5 and was released on March 24, 2007. Monkey CMS is no longer being developed or maintained by its team of developers, so before setting up your Monkey CMS demo pay attention to security vulnerabilities. Some examples of known vulnerabilities are local path disclosure, MySQL injection (error based and time based blind), remote command execution and more.